It's important that when selecting vendors for your health fair, you try to mix it up and have various kinds of services and education - not multiple vendors who represent the same service. Securing too many vendors of the same service typically happens with the chiropractic category. If your company is in a large, populated area, it's quite typical to have multiple chiropractors interested in your health fair. This isn't a bad thing! 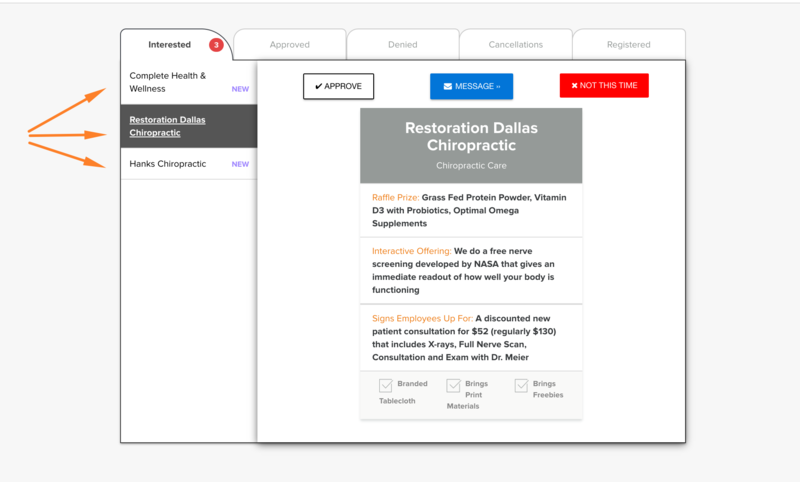 You can review each profile and select the one that is going to bring the most value to your health fair. Depending on the size of your health fair, it might not be an issue to have 2 or 3 of the same vendor type. But we only recommend three if you have a giant health fair - which is at least 1000+ employees with 35+ vendor booths. For smaller events, we recommend trying to keep away from tripling up on the same type of vendor. However, if you do have multiple vendors of the same service, be sure to spread them out around the health fair venue. The more distance in between them, the less chance of friction.